Kevin Butler, Economic Consultant for local accountancy firm Milsted Langdon and former Head of Audit and Regional Director at the Bank of England has written an in-depth analysis of ‘Life in a post BREXIT world’, exclusively for The Business Exchange. With over twenty years of experience Kevin offers a unique insight into what the future could hold. Swindon and Wiltshire’s business profile is characterised by a large number of relatively small businesses, with some large firms and subsidiaries of a few very large ones. Business, financial and consumer services predominate but construction, engineering, food processing and digital businesses are important both to the unitary authority of Swindon and the county of Wiltshire. My own small business is a consultancy that specialises in economic analysis, but I sometimes receive some very odd invitations to tender. In the worrying few days after the Referendum, I was offered a pitch for “Cemetery Operative Training” – a contract being offered by Leicester City Council in case anyone is interested. Not quite my line of work, though a matter of grave importance (! ), but perhaps I should not be choosy in what, following the Brexit vote could become a very choppy business climate for some time. 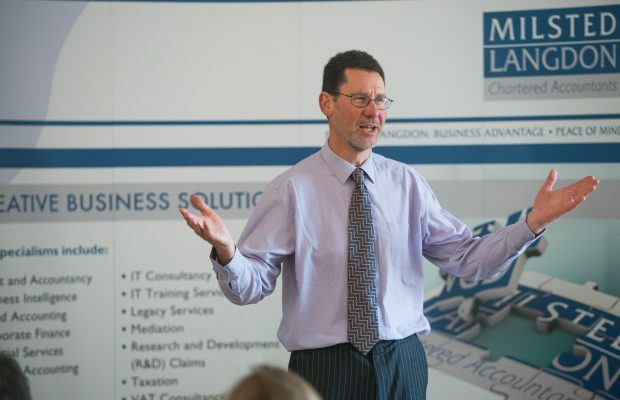 Prior to the Referendum I spoke at a number of seminars, debates and dinners – mostly on behalf of Milsted Langdon LLP. I tried to put both sides of the case for Remain/Leave in as balanced a way as I could, while making it clear that I was firmly in the Remain camp. Without exception all the business groups supported Remain by a clear majority. 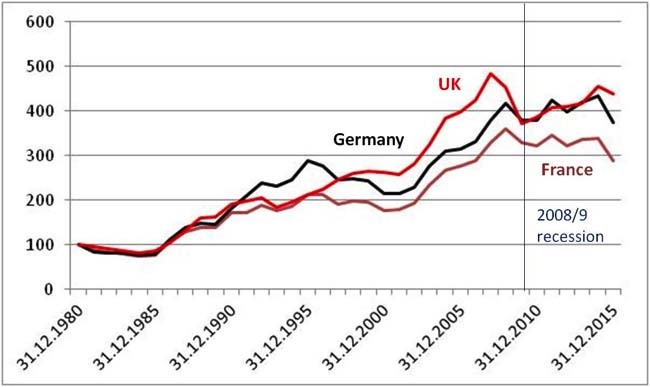 And in terms of output per head of population, the UK has performed well over the years relative to our major EU trading partners, France and Germany, as chart 1 below shows. 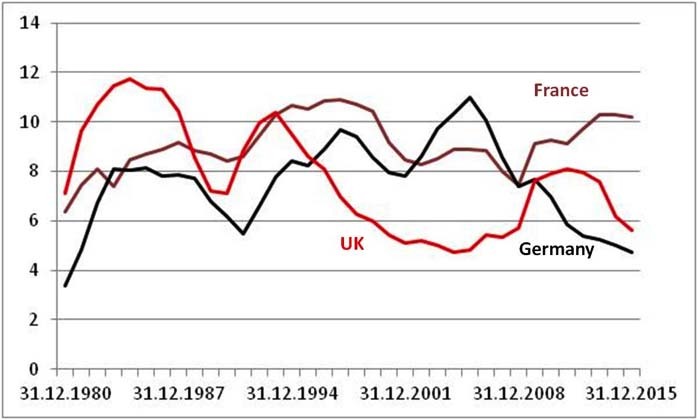 Similarly, as the second chart shows, the UK’s rate of employment and unemployment compares very favourably with Germany and, especially, with France. As the Bank of England Governor has said, the UK has “a dynamic economy” within the European Union. So despite the alleged labour market constraints imposed by EU Directives and regulations, the UK has done well and, in the years ahead, will continue to operate flexible and responsible labour market policies that benefit both employers and employees. However, in the immediate future, uncertainty around Brexit may cause businesses and consumers to hold back spending. Investors, including inward investors from overseas, will want to see how the process unfolds before they commit to new capital. This could produce the slowdown in the UK economy that most forecasters are predicting and sadly this will probably mean an increase in unemployment as businesses adjust to harsher economic conditions. But the 10% fall in sterling’s value that has reflected investors’ worries about the UK’s future may have a silver lining. On the one hand, it will add to the sterling costs of imported food, raw materials, including energy, and consumer goods. On the other hand, sterling weakness may boost the price competitiveness of UK exports – at a time when our balance of payments is under pressure, especially in relation to other EU countries. Treasury forecasts project a set of outcomes around risks from economic uncertainty, the transition process to Brexit and volatility in financial markets. But the Bank of England, my former employers, will most likely take pre-emptive action. The Governor, Mark Carney, has indicated that the Bank’s base rate (0.5% currently) can be cut further and the Bank’s purchases of government bonds (Quantitative Easing) may be increased to provide extra liquidity for banks and businesses. At the same time Governor Carney has stated that UK banks are much better capitalised, and better able to withstand economic shocks, than in 2007/8. As we commence the journey towards Brexit, “when, how and what” will be unclear for some time to come – probably for a few years. So it is helpful for business confidence that Mrs May has been affirmed as the new Prime Minister without a protracted leadership contest. At least one piece of a complex jigsaw will be in place quickly; and early indications suggest that some of the messages from Brexit voters – protesting against “Big Brother” government in Brussels and Whitehall, on the one hand, and a rotten culture in some of the corridors of corporate and governmental power, on the other – have been heeded. So what can firms do to help themselves during this period of uncertainty? One suggestion is to reach out to our stakeholders to provide reassurance that, as business leaders, we will be working harder than ever to ensure good lines of communication. This applies to our customers, our employees and our suppliers. I heard from a UK firm that sub-contracts IT development work to a company in Romania, a spin off from one of the universities there. The firm’s Chief Executive has just been out to Romania to reassure his suppliers that Brexit will not stop his plans to continue a close and co-operative working relationship across the EU border. The message to all stakeholders has to be “we want to carry on working with you for the long term and will find a way.” Finding a path through obstacles in order to make a profit is what risk- taking and being entrepreneurial is all about. A kiwi friend visited me recently. I asked him how long it took New Zealand to recover from the economic shock of losing the “Commonwealth Preference” ie tariff free access to markets in the UK, after the UK joined the EEC in 1973. The question was really about the road to Brexit and beyond. I was initially depressed by his answer – at least 10 years. But, on reflection, while New Zealand’s journey was a hard one, its reforms of the mid 80s, deregulating widely and abolishing import tariffs, were the catalyst for sustained economic success. They developed new markets in the Middle and Far East, reformed their financial structures, became a magnet for international tourism and arguably have never looked back. So my friend’s message was we need not fear Brexit. Come on the All Brits!? !